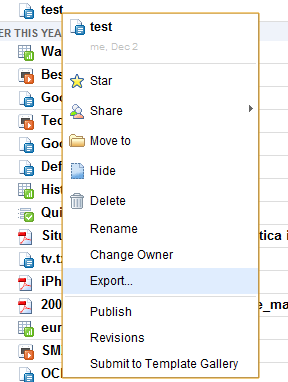 1. right-click on one of the files from the docs list and select "Export"
2. check "export all your files (up to 2 GB)" and click on "Continue"
3. wait until the files are archived or click on "Email when ready"
While this is a great way to backup all your files, an application that synchronizes your documents would be more useful. 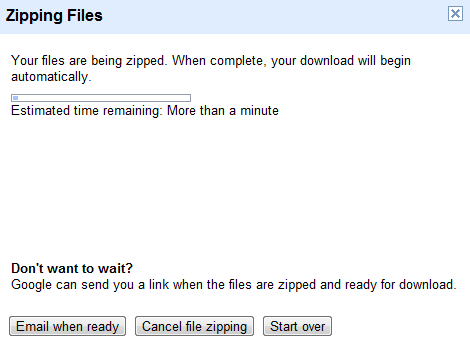 When will Google buy DropBox or something equivalent? Hasn't this been there for a month or two now? 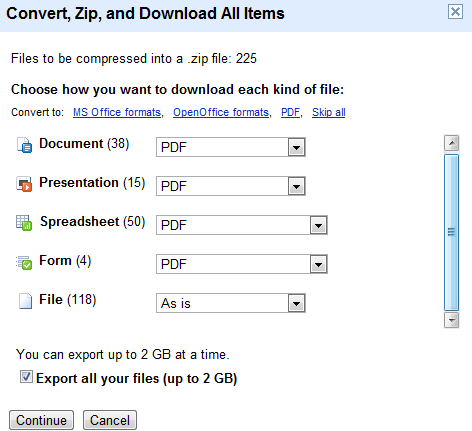 Dropbox supports more files - e.g. .ai files. Google does not! Good start but rather clumsy setup. Selecting ONE file to export all of them doesn't make sense. There should be an export/backup button setup exactly for this purpose. Also, without an automated system which backs-up files daily I'm hesitant to recommend Google Docs be used across our entire company. Great idea, but it is a clumsy setup. I haven't heard anything about GDrive lately, or is this Chrome OS?